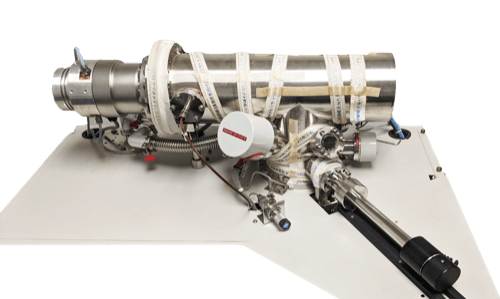 Electron Spectroscopy for Chemical Analysis - Micron, Inc.
Electron Spectroscopy for Chemical Analysis (ESCA), also referred to as X-Ray Photoelectron Spectroscopy (XPS), is an analytical method for characterizing the surface chemistry of materials. Survey Scan – Qualitative identification of all elements except hydrogen and helium within the outermost 20-30 angstroms. High Resolution Segmented Scans – Analysis for specific elements allows precise measure of peak binding energy (related to chemical state) and integrated peak area (related to atomic concentration). Raw data is corrected for sample charging effects and photoelectric cross-section yield. Concentration Depth Profiles – The ability to perform in situ argon ion etching provides a means for characterizing the chemical composition as a function of depth in the sample. Ion etching rate is approximately 10 angstroms per second.